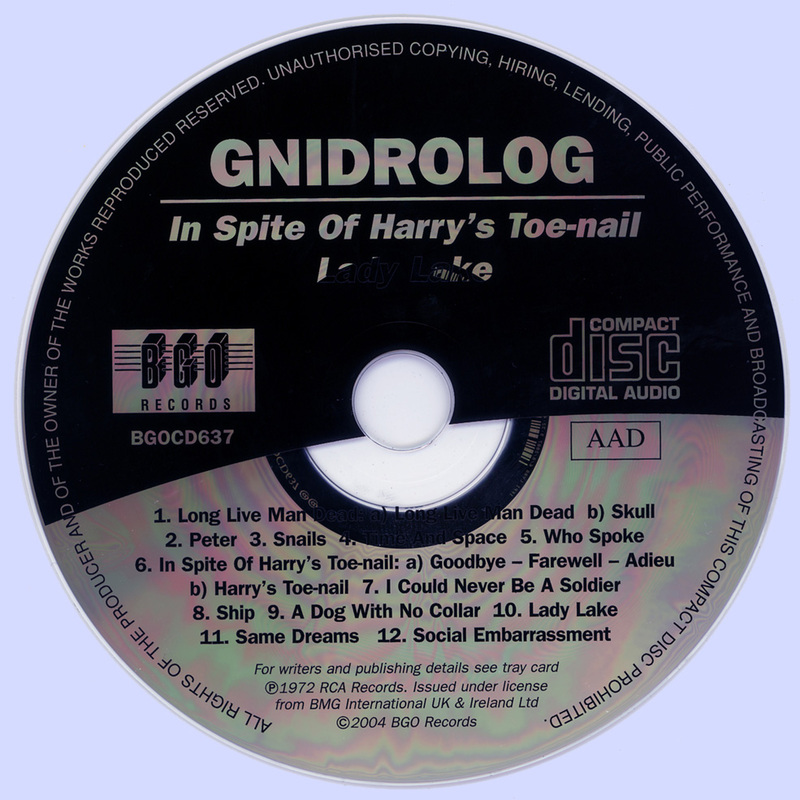 First time around Gnidrolog had a fairly short career running from 1969-1973, but in that time they managed to play some of the classic venues alongside some of the most illustrious names in the history of rock music. Sadly, despite producing some truly inspiring works, they never quite achieved the level of acclaim that they richly deserved. The lineup on this album are Colin and Stewart Goldring, Peter Cowling (bass) and Nigel Pegrum (drums) - who after leaving Gnidrolog went on to join Steeleye Span. The music is a real blend of guitar work and vocals augmented by recorders, flutes, saxophones, harmonicas, and such like. The end result is a unique style that was leading edge for it's time. Now, looking back it's really very hard to tell exactly who was influencing who, but this album certainly has some elements that are strongly reminiscent of the likes of VDGG, Gentle Giant and Jethro Tull. The album opens with 'Long Live Man Dead' and from the outset one is struck by the starkness of the powerful vocals set against some very harsh guitar riffs. After the initial opening the sound throttles back a little and there is a nice passage with woodwind sounds contrasting well with the guitar and percussion work. Vocals continue with less harsh tone, but they are charged with emotion and feeling. 'Skull' is effectively a continuation of the first track and is marked by gently echoing flute work set against the acoustic guitar. The track finishes with a reprise of the opening vocal and guitar theme, before lapsing into a series of musical echoes reminiscent of King Crimson's earlier works. 'Peter' has a very mellow opening with Peter Cowling's cello coupled with a beautiful flute arrangement which plays alongside. Acoustic guitar and vocals add to the air of melancholy on the track. There is a brooding sense of unease as 'Snails' starts up with recorder and oboe. A repeating pattern on the electric guitar soon joins in, the percussion part is gradually introduced and the pace slowly builds up. The vocals intially come in short, fairly quiet sections, alternating with heavy oppressive, and somewhat disharmonious, guitar work. The track is musically very advanced for its time and it provides a relentless assault on the senses as the frenzied pace and feeling of dischord contiues to build - it's almost above likes and dislikes - it simply is! It takes a little getting used to but is very effective. In complete contrast 'Time and Space' is another piece that opens peacefully, a recorder and oboe passage is set against acoustic guitar and a lightly tripping vocal line. It gives way to some far more progressive elements with a much heavier sound. The song seems to have it's roots set in renaissance period music but overall, I am tempted to draw comparisons to King Crimson and Gentle Giant. The following song ,'Who Spoke', is a quiet acoustic guitar track with some very plaintive, almost anguished vocals, very akin to Peter Hammill. The final track 'Goodbye-Farewell-Adieu' is another piece split into two parts. The first section 'Goodbye-Farewell-Adieu' contains woodwind sounds winding gently around, with gentle trills and more quiet guitar work. The vocals are very melancholic with harmonizing that is truly superb. The second part of the piece, 'Harry's Toenail', is an instrumental piece which is suddenly more upbeat with driving drum rhythms and pacey guitar work. Harmonicas give a really nice bluesy feel to the track. The eight tracks referenced above, which made up the original album, were all recorded in 1972. The CD follows the same format as the original album, consisting of just six tracks, with a playing time of just under forty minutes, which actually strikes me as quite long for the year! As with my previous Gnidrolog review I have to reiterate the point that, even with hindsight, it's actually very hard to tell who influenced who, but again there are certain similarities to bands such as Van der Graaf Generator and Gentle Giant - although I find the music here to be much more emotional and capable of creating moods. The opening track, 'I Could Never Be A Soldier', is the longest on the album at 11'36". Although it is, in many ways, a product of its time - written when the the Vietnam war was very much in the media spotlight - it is a song with a clear and powerful message. Having said that, the song is written without any direct reference to time or country and, due to this, the message is humanitarian rather than political and it works perfectly. Musically this is a song of contrasts; at times light and airy, at other times a darker heavier feel prevails - and it is these contrasts that help create a sense of urgency as we move through the track. The verse/chorus structure is apparent in the early part of the song where flute and recorder work feature prominently and create beautiful additions that are woven around the main theme. The instrumental section that follows is a real joy to listen to as a repeating motif comes into play with gentle percussion rhythm, excellent bass work and very subtle echoes cutting in from the guitar. Bit by bit the layers of sound are built up as the percussion becomes more complex and the guitar part fills out, while the flute/recorder sounds really break free from any constraint. The final vocal section is sung with real passion as the song launches into a final instrumental section with a truly breathtaking lead guitar line which is finally joined by the saxophone for the last climactic moments. 'Ship' is one of the highlights of the album. It is a very moving and inspired song and, of all of Gnidrolog's early work, is probably the one I like the most. The song, basically, deals with refugees finally finding a place to call home - but Stewart tells me it actually works on a number of levels. It kicks off with some great sax playing which makes way for acoustic guitar work that supports the vocals for the song verses. The vocals have a slightly raw edge to them, but they command the whole performance gliding effortless through the verses and soaring to ecstatic heights during the chorus, where the saxophone rejoins with magnificent effect. As with the first track this is another number that just builds and builds to a peak ... and the way the guitar and saxophones run rings around each other towards the finish has to be heard to be appreciated. The album's title track 'Lady Lake' is the one most at odds with the rest of the featured material - and is most likely to be a problem for those not familiar with the genre of early experimental prog. Musically this one is very avant garde in its outlook and it seems to be very jazz-influenced. Throughout the early stages of the track there is a sense of structured dischord with driving bass lines and swirling sax sounds which have a very anarchic feel. This starts to die down at the point where the vocal line is first introduced and, at this point, I can sense strong similarities with the style later adopted by Gong offshoot Here and Now. Overtones of an angst ridden Peter Hammill echo through the remaining vocals while instrumentally things seem to settle down into a more structured pattern although the style becomes quite heavy and oppressive. 'Same Dreams' is another very compact song at under three minutes, but it is strong on content. The lead in features some gentle piano playing which continues throughout the whole piece building strongly where appropriate. This is, in fact, the only early Gnidrolog track that I'm aware of which features any kind of keyboard. It is played by Charlotte Fendrich and the style seems to have a classical edge, giving a slightly Procol Harum feel to the proceedings. Pleading vocals and fine harmonisation from the sax come across well and the strong percussive build up to the choruses, supported by fine bass work, is masterful. I have heard it said that the final track, 'Social Embarrasment', sounds more like Gentle Giant than Gentle Giant did themselves, and I have to concede that this is not far off the mark! My only criticism here is that the incessant repetition in the closing section of the song tends to jar the nerves a little after a while but other than that this is a good, if at times quirky, track which makes a strong end piece to the album. 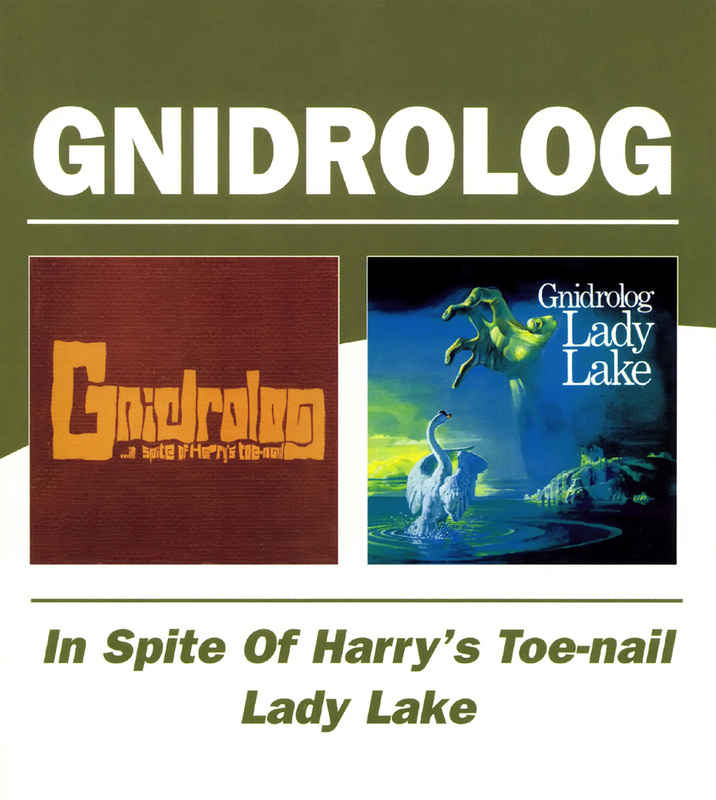 Often overlooked and rarely imitated, Gnidrolog represent many of the best aspects of true progressive rock music. Not only has their album stood the test of time well but it has also retained a freshness that should be a source of real inspiration - and with the exception of piano on one track, still not a keyboard in earshot ... but don't let this put you off! This CD comes highly recommended to all fans of seventies prog or to those who want to discover where it all began! "In Spite Of Harry's Toe-Nail"